Got a sweet tooth? Got a sweet ride? Combine them both into one sweet road trip aimed at visiting some of the sweetest spots in America. We’ve got one chocolate and ice-creamed filled itinerary lined up as we highlight candy and ice-cream tours around the country. Originally started way up north in Mackinac Island, Michigan, Angell & Phelps moved to the Florida location in the early 1940s and has become a favorite among tourists and locals alike. They even cater to the trends and traditions of the area creating molded chocolate race cars in a nod to the Daytona 500 and a molded chocolate foot imprint to entice the tourists that flock to Daytona’s sunny beaches. And, in addition to their traditional hand-made chocolates like cherry cordials and cashew honey bees, they offer some novelty chocolates including chocolate-covered bacon and chocolate-covered potato chips. For more information visit angellandphelps.com. After immigrating to the United States from Greece in 1907, Anthony Zanetos started his life in the candy business as an apprentice to a candy maker in a local shop in Columbus, Ohio. But he had big dreams and in 1916 went into business for himself. He continued on his own but had another big dream – to go into business with his son, Thomas. By the early 1950s, they realized the demand for candy was high, so they decided to focus on candy and formed the Anthony-Thomas Candy Company. Today it remains one of the largest family-owned candy companies turning out 50,000 pounds of chocolates daily. Boehms offers everything from caramels, English toffee, nut clusters, and truffles to European specialties like marzipan and Mozart Kugeln, a small round candy made from marzipan and nougat originally created in Salzburg, Austria in 1890 and named after Austrian composer Wolfgang Amadeus Mozart. If you’re just looking to simply purchase the delicious chocolates, the retail store is open Mondays through Saturdays from 9am to 6pm and on Sunday from 10am to 6pm. 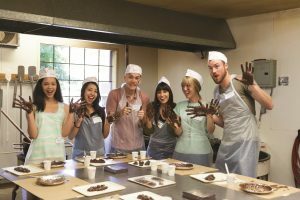 Guided tours allow you to hear a bit about the art of chocolate making and taste some samples as well. For tour information, visit www.boehmscandies.com/tours. In 1915, candy-maker Herbert Haven left Boston and followed his sweetheart to Maine where after their courtship and marriage, the pair settled down and began their hand-crafted candy business. 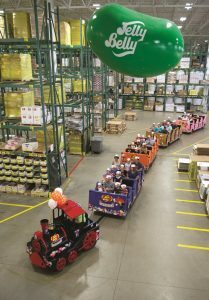 Haven’s become a part of the community and a well-respected business, even doing their patriotic duty during World War II by shipping candy to American soldiers around the world. Now in business for over 100 years, Haven’s has had several owners after the founders sold the business in 1949, but the hand-making tradition continues to this day. They sell candies, chocolates, hand-crafted fudge, and roasted nuts, as well as salt-water taffy in 30 flavors. Self-guided window tours are available at no charge while guided factory tours, at a cost of $2.50 per person, are also available at Haven’s. Each October, Haven’s hosts an Open House on Columbus Day, where the factory is open at no charge to the public. The public is invited to this event to tour the factory and make their own candy! For more information visit havenscandies.com. Did you know the Hershey chocolate factory produces more than 70 million chocolate kisses in one day? Come and see how these iconic little bits of chocolate are made along with many more of the goodies produced by Hershey. Hershey’s Chocolate World is where all the fun happens. Created in 1973 as a replacement for the chocolate factory tour, Chocolate World welcomes 1.4 million visitors annually. 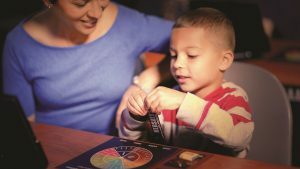 Attractions at Chocolate World include the Chocolate Tour, a free-of-charge, seated tour, that shows the chocolate making process from cocoa bean to finished product; the Create-Your-Own-Candy Bar experience where visitors select the ingredients and “assemble” a candy bar that is uniquely their own; and the Chocolate Tasting Group Experience where a chocolatier explains, and lets guests taste, different varieties from milk chocolate to dark chocolate. There are also several eateries, souvenir shops, and ,of course, one of the largest candy stores you’ll ever experience. For information on Hershey’s Chocolate World visit hersheys.com. In 1869, when 24-year old Herman Goelitz opened his candy business in Belleville, Illinois, Ulysses S. Grant, an Illinois resident, was the country’s president. But it was another US president with ties to Illinois that made one of Goelitz’ candies a household name. The Jelly Belly shot to fame thanks to our 40th president, Ronald Reagan. The story goes that when he began his campaign for the California governor’s office in the mid-1960s, Reagan decided to give up his pipe. He opted for jelly beans as his replacement for the pipe and he chose a new mini jelly bean, manufactured by Goelitz’s company, as his new “vice.” When Reagan took office in 1967, Goelitz’s company had a standing order to deliver jelly beans to California’s government offices each month. A decade or so later, Reagan had his eye on the White House and Goelitz had recently introduced his line of “gourmet jelly beans” and the “jelly belly” candies were shipped complimentary to Governor Reagan as part of his standing order. Reagan liked them so much, he switched his order to be exclusively jelly belly. As he turned his aspirations to the White House, the press got a hold of his love for the Jelly Belly candy and the rest is history. Goelitz manufactured red, white, and blue Jelly Belly candies and shipped three and a half tons to D.C. just in time for the inauguration festivities. Flavors included Very Cherry for red, Coconut for white, and Blueberry (which eventually became one of the most popular flavors) for the blue. The popularity of the Jelly Belly took off and the company eventually renamed themselves, The Jelly Belly Candy Company. Through the years, they’ve created flavors based on the Harry Potter books and movies, worked with Cold Stone Creamery to create flavors that taste like ice cream, produced an organic line and even a spicy line based with tabasco sauce as an ingredient. Factory tours are available at the locations in California and Wisconsin. At the Fairfield location, visitors can enroll in Jelly Belly University where they can earn a degree in Beanology® and go in-depth to learn all things Jelly Belly. There is also a basic, self-guided walking tour available. 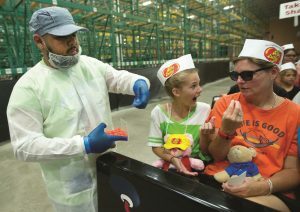 At the Wisconsin location, visitors can hop aboard the Jelly Belly Train, tour the warehouse, and watch videos that detail the production of this popular little candy bean. For more information visit jellybelly.com. The experience at the South Bend Chocolate Company is more than just a factory tour – it’s a history lesson as well. The 58,000-square foot facility houses a factory as well as a museum that is home to one of the largest collections of chocolate memorabilia in the world. The tour itself provides a bit of history about chocolate as well as the factory process and ends with a test sample. There’s even a company mascot, Señor Koko Bean! The company began making chocolate for nearby Notre Dame University, initially producing just three products, The Domer, The Rockne, and Nuts for ND. It now produces many more items including chocolate pretzels, malted milk balls, chocolate-covered coffee beans, and chocolate-covered Michigan cherries. For tour information visit www.sbchocolate.com. In the summer of 1978, Ben and Jerry set up shop in an abandoned gas station in northern Vermont. With just one five-gallon ice-cream maker, they cranked out batches of the now famous Chunky Monkey and Heath Bar Crunch – and the rest, as they say, is history. It wasn’t long before Ben & Jerry’s was a household name. Factory tours in the Waterbury facility run about 30 minutes and showcase how the fabulous ice cream is made as well as the highlighting the company’s philosophy. 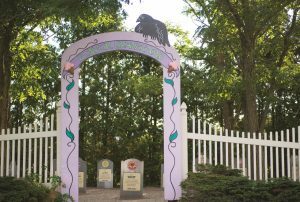 Visitors can also walk through the Flavor Graveyard, where “dearly de-pinted flavors of year’s past” can be remembered. For information visit benjerry.com. The tour of Goody’s a quick one, but it’s a twofer (they make both ice cream and candy! ), so it’s worth the visit. Self-guided tours are free of charge and include a free chocolate sample. Guided tours are $2 per person and include 6 different samples of delicious sweets from Goody’s. Big windows give visitors a glimpse into the factory floor where Goody’s produces about 20 tons of gourmet chocolates annually. They also make toffee, caramel corn and of course, ice cream! 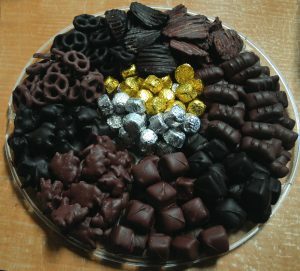 For more information visit goodyschocolates.com. Homeland Creamery is a family-owned and operated dairy farm, located in Julian, North Carolina, whose products include butter, buttermilk, and eggnog in addition to their ice cream. The tour includes a 30-minute hayride that takes you around the farm where you can glimpse the crops as well as the cows. The tour also includes a visit to the barn and time spent with baby calves. Best of all, the creamery provides ice cream samples at the end of the tour! For more information, visit the creamery’s website at homelandcreamery.com. 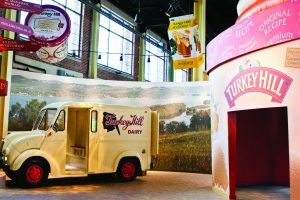 Located in the rolling hills of Pennsylvania Dutch Country, a visit to Turkey Hill is definitely worth the trip The Turkey Hill Experience, as it is called, is both educational and great fun at the same time. There’s the Taste Lab and an “Ice Cream 101” quickie course to learn the basics about ice cream making as you make your own flavor. You can also “milk” the mechanical cows, be the star of your own Turkey Hill “commercial,” and taste and sample Turkey Hill’s products to your heart’s content. For more information on the Turkey Hill Experience, visit turkeyhillexperience.com.